Disclaimer: None of these people belong to me; they all belong to themselves. None of this is true in any way, shape or form. 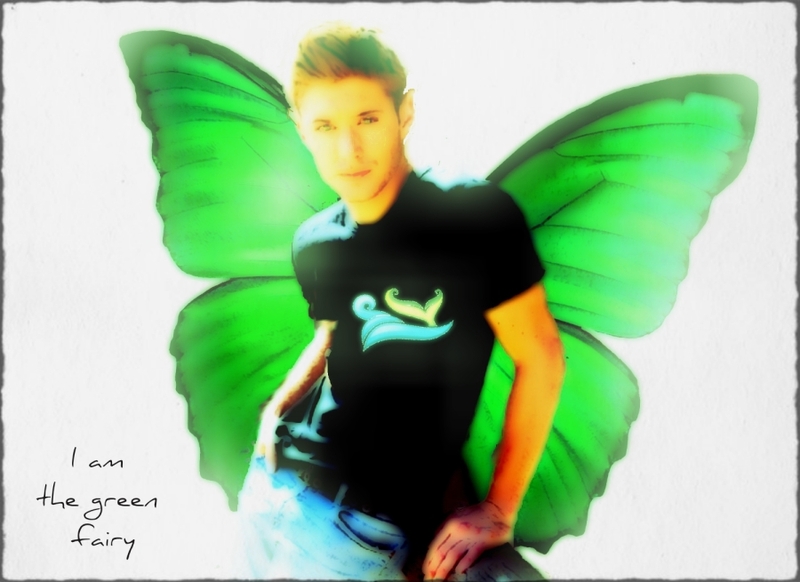 I made it all up, obviously, Jensen is not a green-winged fairy. Summary: Written in response to a prompt by angelzfurys at spnkink-meme. Jensen loves his friends and his life in the meadow, but his curiosity about the humans who will soon be moving into the houses beyond the tree line on the other side of the meadow leads him to undertake an adventure. Traveling alone is dangerous for a fairy. Everything is bigger than they are and, although they have some protective magic, it often isn't enough. Add in the very real risk of touch starvation and it's easy to see how this adventure could end in tragedy. A/N: Thank you etoile_etiolee. Your beautiful manip of fairy!Jensen gave me the last little push I needed to write this fic. You are a great friend and a very brave person! The night shift at the hospital lasts until 8am, so Jared decides to swing by the realtor's office right after work. His new house is ready for him and he can hardly wait to get there and start unpacking his boxes. Apartment living is okay but, now that he's finally completed the residency program, he's ready to take the next step in his life, a step that includes home ownership. A house means permanence and stability and that's exactly what Jared needs. The journey to this point has been long and hard. There have been times when he's thought about giving up on his dreams. Jared loves helping people, he really does, it's just that sometimes, well...sometimes being a doctor isn't all it's cracked up to be. One of the things he's had to come to terms with is that he can't save everybody, no matter how dedicated he is or how hard he tries. That knowledge has come with a high price tag. He's learned not to become personally invested in his patients' outcomes. He's had to harden his heart a little bit. His realtor hands him a padded envelop with a professional handshake and a, "Congratulations Mr. Padalecki. It's all yours." Jared smiles at her. She's been great throughout this entire process, going well above and beyond her normal duties in order to accommodate his busy schedule. He pulls the brass key out of the envelope, lets it sit in the palm of his hand before tossing it in the air and catching it. Next stop, home sweet home. The key slides smoothly into the lock and makes a satisfying click as he unlocks the deadbolt. The house smells of fresh paint and cardboard. Jared breaths in deeply, taking time to appreciate the moment. Three bedrooms, two and a half bathrooms, a kitchen fit for a gourmet chef, and a living room which he is hereby dubbing the game room. And it's all his. He wanders from the front hallway, past the coat closet, and into the game room. The sheer number of boxes scattered about the space is more than a little intimidating. Truth be told, now that he's here, he's not sure where to begin. Luckily, the contents of each box are clearly visible, written in black Sharpie ink. Jared has never been happier about his OCD tendencies. Yawning, he looks around, still feeling like he's lost in a maze made out of cardboard. It had been a hectic night at the hospital and he's not as clear-headed as he needs to be for this task. Coffee. Coffee sounds like an excellent place to start. The coffee maker is in the kitchen, somewhere, so Jared heads in that direction, sidestepping a box of books and bumping into the couch on his way there. One of the many boxes in the kitchen holds his Keurig, a couple of K-cups and a mug for just this occasion. It's only a matter of finding it. He's in the process of shifting a stack of boxes over so he can get to the ones behind it when he sees a doll lying on the counter. Jared doesn't own a doll. His first thought is that one of the movers must have left it there accidentally. Or maybe it belongs to the realtor's child. As soon as he walks closer though, he realizes his mistake. It's not a child's toy. For one thing, dolls aren't usually that anatomically correct. Nor are they that life-like. Jared stares, not sure he can believe his eyes. He knows fairies exist, he's watched documentaries about them, seen pictures of them, but he's never seen a real one before. Fairies are extremely rare, almost like an endangered species. And this one doesn't look at all well. It's a male, that's easy to see right away since it's lying on its back and it - he - is not wearing any clothes. His iridescent green wings are spread out underneath him. They look somewhat ragged and very, very fragile, like the slightest touch could cause them to disintegrate. His facial features are lax and his eyes closed. He could almost be asleep if not for the translucent, unhealthy tone of his skin. Jared's stomach clenches. He gets that familiar, queasy feeling he always gets when faced with a problem he knows he won't be able to solve. Fairies are delicate creatures and this one is very sick, probably suffering from severe touch starvation. He's all alone and who knows how long he's been trapped in Jared's house. "What happened you, huh?" Jared whispers as he gently runs the tip of his finger along the fairy's slender arm. At his touch, dull green eyes shoot open. Jared gasps and pulls his finger back. The fairy looks up at him, such a depth of emotion swirling in his eyes that Jared is stunned. The tiny creature blinks a few times and then seems to lose his struggle to remain conscious. His eyes close and stay that way. Jared's heart sinks and he knows he's done for, knows he's going to do whatever he can to save this fairy. He also knows that it's most likely a lost cause and he's going to lose his own heart in the process. Touch starvation can only be cured in one way, constant skin-on-skin contact, constant care, and constant attention. Even with all that, chances are this fairy isn't going to make it. He's just too far gone already. Even as Jared takes off his shirt, he tries to steal himself for the inevitable. He needs to shut down that part of himself that tends to get too emotionally involved, to care too much. But one look at that tiny face and he knows it's too late. The memory of those green eyes, dulled by advanced stage touch deprivation and still so expressive, is going to haunt him for a long time after this is over. There are so many reasons not to take on the rehabilitation of a desperately ill fairy - he'll be unable to do anything else for days, the hospital will have to get another doctor to cover his shifts, and his unpacking will have to be put on hold indefinitely. None of that is the real reason Jared's stomach is in knots though. Very carefully, Jared slips his hand under the fairy and picks him up, making sure to support his head and keep his wings from getting crumpled. This time, there's no response to Jared's touch, not that Jared had expected there to be. The little body is cold from where it's been lying on the granite countertop. Jared drapes the fairy over his forearm and cradles him against his bare chest so that there's as much skin-on-skin contact between them as possible. The body heat will help keep him warm while the contact will provide essential nourishment. The fairy seems to melt against him, boneless, as if on some level he realizes what's happening and accepts Jared as his last hope for survival. "Yeah, I know. You've had a rough time of it, but I'm here now and I'm going to help you," Jared murmurs to the limp form in his arms. He believes in talking to comatose patients. He thinks the meaning and intention behind the words get through even if the words themselves don't. Forgoing his coffee fix, he returns to the game room and settles in on the couch for the long haul. Touch therapy requires more than simply holding the fairy and sharing his body heat. Full body contact is a good start, but for a case of touch starvation this acute, additional steps have to be taken. The fairy's nerve endings have to be stimulated continuously by rubbing his skin. Jared starts by brushing a fingertip lightly down his tiny patient's chest, over his stomach, his hip, and along his leg all the way past his ankle to the sole of his wee foot. With his thumb and forefinger, he bends the leg at the knee, softly massages the muscles in the thigh and the calf. He does this several times and then he shifts the fairy over so he can do the same with the other leg. Next, he picks up one of the fairy's hands, marveling at how small and delicate it is. The fingers are finely formed, elegant. Jared manipulates each one, gently bends the wrist, the elbow, and rotates the shoulder, all with the fairy nestled against his chest. Working with these miniature limbs is meticulous work, all the more so because they are completely malleable, offering no resistance while the fairy is unconscious. One wrong move and a bone could snap or a ligament could be pulled. Jared goes through multiple repetitions with the other arm and moves on to the wings, turning his patient over so he's lying on his front, wings and back easily assessable. Thanks to the documentary Jared had watched during his med school days, he knows that fairies' wings are highly sensitive, containing more nerve endings than any other part of their body. His fairy's wings are the color of uncut emeralds, not as brilliant as they probably are when he's healthy, but quite beautiful nonetheless. They remind him of a cross between dragonfly and butterfly wings, as sheer as gossamer and yet strong enough to enable aerial stunts more dramatic than any airplane. Jared imagines how his fairy must have looked before this happened to him, zipping around with the sunlight making his wings sparkle, fairy dust trailing behind him like a tiny comet. He must have been breathtaking. Then Jared wonders when he started thinking of this fairy as 'his'. Sighing, he shakes his head at his own stupidity. Stop it, he warns himself, even though he knows it won't do any good. "You're going to have to wake up soon so you can tell me your story, Comet. How in the world did you end up in my house of all places?" Jared winces when the name comes out of his mouth, but he supposes giving the fairy a name is better than continuing to think of him as 'the fairy' and infinitely better than 'my fairy'. The wings feel brittle as he smooths a finger over them, as though dangerously depleted. The doctor in him wants to hook Comet up to an IV and pump fluids into him. Fluids won't do him any good though since fairies don't drink or eat. They get all their nutrition from touch. Which begs the question of where Comet's friends are. Fairies don't travel alone. If they do, they die. Comet is a case in point. "Where are your buddies?" Jared croons. "Why did they let you go off all by yourself? Are they looking for you?" The questions keep mounting and there aren't any answers forthcoming. Comet hasn't so much as twitched since that first touch. His chances of recovery are getting slimmer with every moment he remains unresponsive. Jared's throat closes up and he has to swallow hard against the constriction. There's a strong possibility he may never know what happened to this poor little guy. Jared continues his ministrations for what seems like hours, stoking the entire surface of Comet's wings, his back, his bottom, the backs of his legs and arms. Turning him over again, Jared sweeps the pad of his thumb over the fairy's cheeks, his up-turned nose. He stares at the elfin features, the tousled, light-brown hair, the slightly pointed ears, and the pale freckles. "Come on, open your eyes. I'm not gonna give up on you, but you have to fight this." There's no movement other than the shallow rise and fall of the fairy's chest. Slouching into the couch cushions, Jared heaves a sigh. His eyes are burning and he really needs that cup of coffee if he's going to wait this out until the bitter end. "Come on, little one. I need a sign here. Give me something to go on." The indentations of each rib are discernible under his fingers as he absently rubs Comet's side. Jared's gaze shifts to the kitchen doorway through which he thinks he sees the box he packed his coffee maker in. It would only take a bit of manual dexterity to get the Keurig out, make a cup of coffee, and hold Comet at the same time. He could totally do it. His thoughts are interrupted by a weak whisper of a voice. "Guardian?" Jared's full attention snaps back to the tiny creature in his arms. Unfocused eyes are once again open. Tremors start up in the wings and quickly spread. "Hey. You're awake. It's okay. Hush now, it's going to be okay," Jared tries to sooth his trembling patient. Well, he'd asked for a sign and he sure got one. Comet is awake, but that doesn't mean he's out of the woods yet. Poor Jensen--but things will be okay now! I can't wait to read more! I think there may have to be at least an epilogue to this story because there's a good chance it's not going to wrap up in one more part. *sigh* So much for my ability to estimate story length. M'awwwwww!!!! Poor Jared doesn't want his little fairy to die! And Jensen is SO CUTE! Poor wee Jensen! Like how in this world Fairies are known, so Jared has a good idea what's wrong and how to, hopefully, fix it. This whole story is so adorable. And it must be since I can't remember the last time I actually used the word adorable. Aw - really enjoying this! Jared to the rescue! And he's a sweet, caring doctor, just what Jensen needs. That's some commitment, having to constantly touch Jensen's tiny, naked, beautiful body until he recovers and knowing it could take days....mmm I want a fairy Jensen! I know! I'm not sure how he can give up everything else he has going on to spend several days nursing tiny, adorable, naked, fairy Jensen back to full health. I'd have trouble with that myself - NOT! :D Thank you!